Microsoft has unveiled a new range of laptops aimed at schools and students. With prices starting at just $189, these new Windows 10 devices are designed to crush the Chromebook rebellion The Chrome OS Challenge: A New User's Day on a Chromebook The Chrome OS Challenge: A New User's Day on a Chromebook What are Chromebooks like for someone who's used to a Windows or Mac setup? As a newcomer to Chrome OS, I'm here to tell you. Read More currently threatening to topple the Microsoft empire. Or whatever analogy works for you. Microsoft has announced its plans for education for 2018. Which involves new low-cost Windows 10 devices from Lenovo and JP, new updates for Office 365 Education, and a free update for Minecraft: Education Edition designed to help “engage students of all ages in chemistry”. On the software front, Microsoft has a host of updates lined up for Office 365 Education. These include a dictation feature, the ability for teachers to lock pages in Class Notebooks, and the ability to record lessons in PowerPoint, with Stream adding automatic captioning. Finally, there’s the free Chemistry Update coming to Minecraft in the spring. This update will mean that “through hands-on experimentation, students can learn everything from building compounds to more difficult topics like stable isotopes.” All using the familiar world of Minecraft. Is Minecraft Enough of a Pull? The new devices Microsoft has unveiled look fine. And because they run on Windows 10 Best Windows 10 Ready Hardware & What It Means Best Windows 10 Ready Hardware & What It Means Some of Windows 10's new features require special hardware. We show you what to look out for and which devices best support Cortana, Windows Hello, and Continuum. Do you really need it? Up to you! 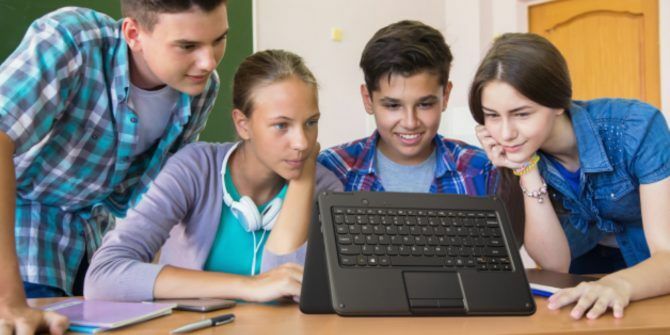 Read More they offer some advantages over Chromebooks. However, many students seem to prefer the simple and secure alternative that is Chrome OS. Which means Microsoft needs to offer something extra to compete. Whether the free Chemistry Update for Minecraft is enough of a pull remains to be seen. What do you think of Microsoft’s strategy to entice schools back to using Windows? Can Microsoft beat Google at its own game? Or are Chromebooks now established as an alternative for students? Are you tempted by the new devices? Please let us know in the comments below! Explore more about: Chromebook, Minecraft, Windows 10. Given how incredibly weak Windows Store apps are and how easy it is to manage Chromebooks at the institutional level, I can't think of a single reason to consider Windows S. Office and VBA support really aren't enough; being able to interoperate between data sources and some of the other advanced features Microsoft productivity tools really aren't that exciting for K-12 education while Google's (free) online products are perfectly suited to the basic needs of document creation. Microsoft has to at least try to compete, but it's going to lose and in so doing lose yet more mindshare for its other products. I suppose that in 10 years we'll all be complaining about the stranglehold Google has on low cost and educational computing, but right now it seems to be the best path forward.